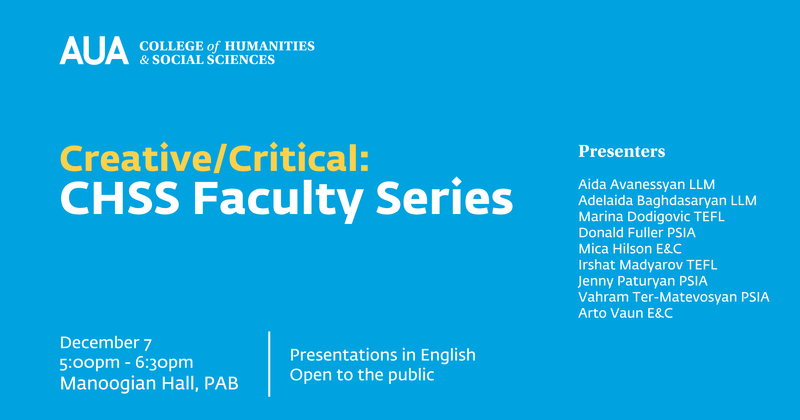 Creative/Critical discussion series of the College of Humanities and Social Sciences (CHSS), featuring the scholarly and creative output of CHSS faculty members, kicks off with its inaugural panel discussion on Friday, December 7, 2018. This first panel will feature brief presentations of the recent and/or forthcoming scholarly work of nine faculty members from the PSIA, LL.M., TEFL, and E&C programs, with the aim of introducing the larger AUA community to our critical output, in all its variety. In the interest of sharing the full spectrum of the critical work we do, panelists will speak on subjects as varied as ecocriticism, liability issues involving artificial intelligence, Armenian-American poetry, Armenian civil society, perspectives on teaching practica, the importance of institutions, ethnic conflicts in the South Caucasus, and learning vocabulary.